Over the last few years, my "Let Me Entertain You" board on Pinterest has exposed us to loads of new recipes and party ideas. I've been pulling out my cookbooks and old Cooking Light issues less and less in lieu of heading online. This past holiday, I grabbed the supplies for the Bubble Up Breakfast Bake after seeing the savory photos pinned to my feed. We headed to my sister's for Christmas, prepared to provide a tasty meal for everyone the next morning. 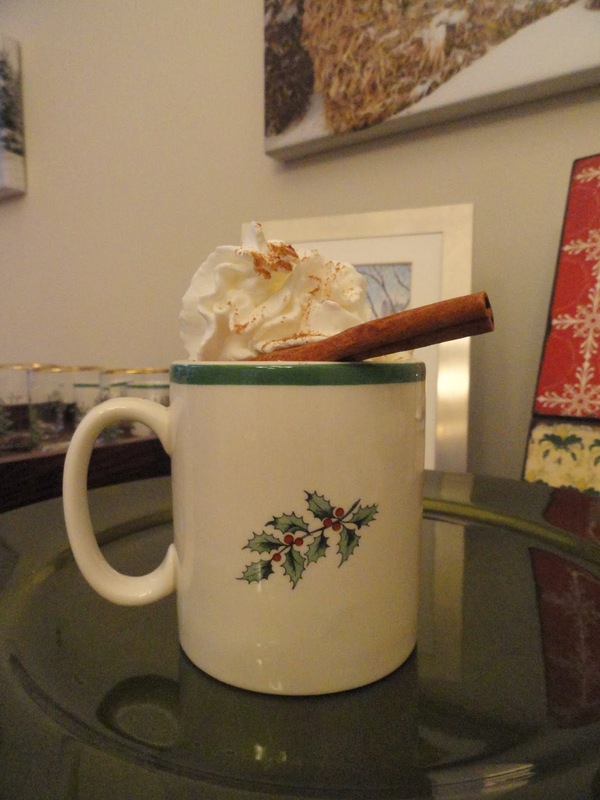 But first, my sister had the same idea to get her pinspiration on for an afternoon holiday drink. 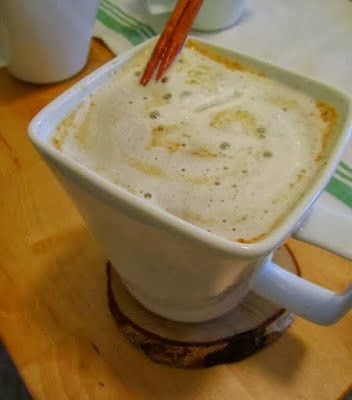 I helped her make Crockpot Pumpkin Spice Lattes that even this non-coffee drinker really enjoyed. We started with 8 Tablespoons of pumpkin puree, 8 Tablespoons of vanilla (yes, even though that sounds like a lot! ), 8 Tablespoons of sugar and 2 teaspoons of cinnamon mixed in a bowl. The pumpkin mixture was stirred into the crockpot that was filled with 6 cups of milk and 4 cups of brewed coffee. This was simply heated up for a couple hours on high and then served with whipped cream and a cinnamon stick for garnish. Yum-o. Now back to the breakfast bake. I'm a sucker for a good egg bake - I have a few recipes on hand from years past including this ham and cheese breakfast casserole. But this one was a little different, featuring biscuits along the bottom to give it some lift. A tube of biscuits was cut up and lined along the bottom of a greased pan. A pound of sausage was cooked up and the grease drained. The cooked sausage was poured over the biscuits and sprinkled with two cups of cheddar cheese and a small can of diced green chiles. A whisked mixture of 6 eggs, salt, pepper and 1/4 cup milk was then poured over the bake. We cooked it for about 30 minutes in the oven at 350. Easy enough. The biscuits were cooked perfectly and gave the bake a nice lift - something I had to see to believe after being suspicious of how few ingredients there were in this bake. What Pinterest food are you feasting on lately? I've been busy pinning soups to make in these wintery months. A grocery list seems to be in my near future. . .